How does the braking system of a vehicle work? Through the braking of the front wheels only. Through the pressure created between the engine and the clutch. By turning the engine opposite to its normal direction of turning. Through the friction between the brake disc and the brake pads. 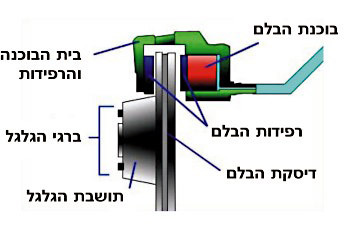 What is the main function of the auxiliary brake (hand/parking brake)? To assist new drivers in downhill braking. To make sure that the vehicle doesn’t move while parked. The auxiliary brake (hand/parking brake) has no function and it shouldn’t be used at all. To enhance the braking capacity of the service/leg brake. A vehicle which had two regular engines. A vehicle which has an electric engine next to its regular engine. A vehicle which has two electric engines instead of the regular engine. A vehicle which has a solar engine (powered by the suns energy) besides its regular engine. “Keeping a safe distance from the vehicle in front affects fuel consumption and vehicle wear and tear”. Correct or incorrect? Incorrect: The distance has no influence on vehicle wear or fuel consumption. Correct: Keeping distance prevents brake wear and excessive fuel consumption due to frequent acceleration and braking. Incorrect: Using the breaks and the accelerator in order to regulate wind flow is important for increasing the driver’s alertness. Incorrect: Keeping proper distance from the vehicle in front of you causes brake wear. What should you carefully check while purchasing a used tire for your vehicle? Only that the size of the new tire is identical to that of the old tire. Only that the shape of the tire’s sole (the tire’s surface) is identical to that of the old tire. Only that the air pressure of the new tire is identical to that of the old tire. The tire’s manufacture date, to ensure it is not too old (over 2 years). What is the function of the ABS System? To shorten the life span of the tires. To facilitate softer and milder braking on a wet roadway. To maintain the vehicle’s steering and maneuvering abilities during emergency braking. To facilitate softer and milder braking on a dry roadway. The number of kilometers traveled by the vehicle, as indicated on its odometer. The number of traffic offenses perpetrated within the vehicle. The number of seatbelts in the vehicle. The number of head-rests in the vehicle. How braking cancels the ABS. Hard braking will cut out the engine. Hard braking causes stopping on the spot. Hard braking causes vibrations and noise. What is the consequence of tyre pressure that is too high? Uneven tire wear and shortened of tyre life. It is harder to turn the steering wheel. Rapid wear and tear of the steering wheel. Longer tire life span and reduced fuel consumption. What are you required to do when the brake-check lamp lights up while driving? Continue driving normally until the vehicle’s periodic treatment. Stop the vehicle and don’t resume driving. Continue driving slowly until the garage. Continue driving normally until the garage. Step on the brake pedal, press on the selector lock button, and apply the gear selector to Drive. Step on the brake pedal and the gear will be shifted automatically. Press on the immobilizer (operating button) and the gear will be shifted automatically. Step on the clutch and shift the gear handle. Of the same manufacture date always. Of the same size and in compliance with the manufacturer’s manual. When is a blue warning light displayed on the dashboard? When the high beam is turned on. When the low beam is turned on. When the parking lights are turned on. What might be the consequence of excessive brake use? Overcooling of the brakes and increase of braking efficiency. Overheating of the brakes and decrease of braking efficiency. Excessive use of the brakes should cause no concern. The power of the engine might be decreased and it might even stop working. Reduces the extent of injury during an accident. Reduces the driver’s movement in his seat and prevents accidents. What is the risk of using the GPS navigation system while driving? There is no risk in using the GPS navigation system while driving. It is only beneficial. Disruption of the engine management systems. Fast draining of the vehicle’s battery. What should you check when purchasing a new tire for your vehicle? The tire’s manufacture date, to ensure it is not too old (over 6 years). What would you do to achieve safe driving down a continuous steep slope? It is not recommended to drive in a sharp descent for a long time. You should rely solely on the engine’s braking power. You should step on the brake pedal firmly and continuously to maintain the desirable speed. Which accessories reduce the severity of injury in a road accident? Rear wipers and head rests. Seat-belts, head-rests and air bags. Fog lights and orthopedic seats. The brake and clutch pedals. What are you required to do if you detect a malfunction in the braking system while driving? Slow down and try to accustom yourself to the situation and complete your drive safely. Slow down and rely on the ABS System. Continue driving very carefully and use the parking brake. Stop driving immediately and ensure that the vehicle is towed to a garage and checked there. Continue driving, provided that there is enough oil in the oil sump. Stop the vehicle immediately and shut-off the engine. Continue driving if the engine’s thermometer indicates normal engine temperature. How should you use the gearbox while driving on a continuous descent? The gearbox should be in high gear. The gearbox selector should be in a low gear. The gear used while driving on a continuous descent is of no importance, as long as the brakes function properly. The gearbox handle should be in neutral gear. Noted in the vehicle book. Noted in the vehicle’s registration document. Noted in the vehicle’s insurance policy. How would you shift to a lower gear while driving uphill in an automatic transmission vehicle, without moving the gear handle? By taking the foot off the brake pedal without giving gas, in order to get the right speed. By a sharp and quick pressure (“kick down”) on the accelerator, or by applying a designated electric switch. By stepping firmly on the brake pedal. By gradually stepping on the accelerator, until getting the desired result. What might happen as a result of brake over- heating? The vehicle will lose its steering properties. The tires will heat and wear-out more. The brakes efficiency is significantly reduced.